The content designers provide both a graphical editor and an HTML code editor. The HTML that they generate is compatible with any HTML renderer, but they also support a few custom attributes that support the drag-and-drop design elements and general style settings provided by the graphical editor. 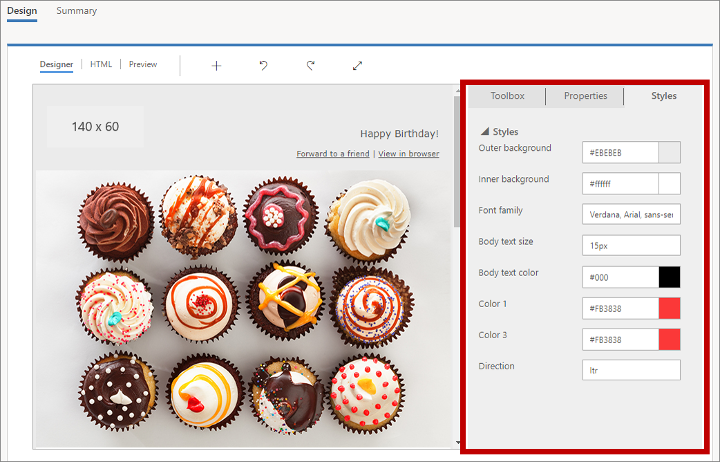 The default message templates and page templates provided with Dynamics 365 for Marketing make use of these custom attributes to make it easier for you to customize them in specific ways. You can also make use of these custom attributes when designing your own templates. The following table provides a quick reference to the custom attributes and meta tags described in this topic. The remaining sections of this topic provide more information about how to use each of the features summarized in the table. The following image shows the same design in full-page-edit mode (left) and drag-and-drop mode (right). The only difference is the design on the right includes the meta tag, so drag-and-drop is enabled, and the side panel is shown. 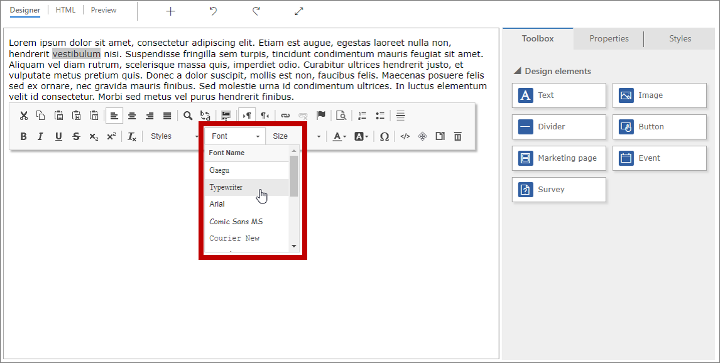 When using the full-page editor, you can still select, edit, and style text using the text-formatting toolbar (shown), and can also double-click on images, links, and other elements to set their properties using a pop-up dialog. The toolbar also includes the assist-edit button for adding dynamic content, such as field values drawn from each recipient's contact record. On the Designer tab, users can only edit content contained within a design element, and can only drag new design elements into those parts of the document that are set up as data containers. Therefore, you can create templates where some areas (outside of containers) are locked to editing on the Design tab, while other ares (inside unlocked containers) will accept edits and dragged content. When the full-page editor is enabled, all drag-and-drop features are disabled, and you can edit all the content on the Designer tab, including content outside of data-container div tags (which have no effect in the full-page editor). You can lock a container to make all of its content read-only on the Designer tab. If a locked container contains design elements, then all content and settings for those elements will remain locked, and the Properties tab will never be shown for them, even if you select them. You might use the container-locking feature to lock a container after you are done adding and configuring design components for it. Each time you add a design element using the Designer tab, the editor inserts a pair of <div> tags to mark the start and end of the element, and creates whatever HTML is required to display the element as specified in its settings on the Properties tab. The following table lists the available values for the data-editorblocktype attribute. For more information about each of these design elements, see Design elements reference. When you are working on the HTML tab, you should avoid editing any of the content between the <div> tags of your design elements because the results of doing so can be unpredictable, and your edits are likely to be overwritten by the designer anyway. Instead, use the Designer tab to manage your design-element content and properties. When a design element is marked as protected, users working in the Designer tab for a page or email won't be able to edit the element's properties or content. This attribute is always included for the content-block element, but you can add it to any type of design element to protect it. Any design element that includes this attribute is shown as shaded on the HTML tab to indicate that it's protected, but you can still edit it there if you insist. Set this attribute to "false" (or just remove it) to remove protection from a design element. Text-elements provide a pop-up formatting toolbar in the designer, which includes a menu for applying a font to selected text. Where <font-list> is a semicolon-separated list of font names. One handy feature of the out-of-box templates is that they provide global style settings on the Styles tab, which let users quickly adjust the font family, color palette, and other global settings enabled for the template. Each template includes only those style settings that make sense for that specific design, and you can likewise design templates that provide just the right style settings for you and your users. Add a <meta> tag to the <head> of your document to create the setting. Set up styles and/or HTML tags that apply the settings created by the meta tag. The following subsections explain how to do each of these things. <name> identifies the meta tag, which you must also reference in the styles and HTML tags where the setting will be applied. <initial-value> is an appropriate default value for the style. <data-type> identifies the type of value users will provide. This setting affects the type of control that is presented on the Styles tab. You must use one of the values listed in the following table. <label> specifies the text to be shown in the Styles tab for the setting. color Sets a color using hash-tag values like #000 or #1a32bf. Creates a color-picker control on the Styles tab. font Sets a font-family name. You can also set up font stacks by using a comma-separated list of font names in order of preference. Creates a simple input field on the Styles tab. number Sets a numerical value with no unit (use text to allow units like px or em to be specified together with the value). Creates an input field with up/down buttons that can also be used to increment/decrement the current value on the Styles tab. picture Sets an image source (as a URL). Creates a simple input field on the Styles tab. text Sets a value that can include both text and numbers. Also use this data type for numerical values that may include a unit (like px or em). Creates a simple input field on the Styles tab. The label shown on the Styles tab may appear in square brackets, such as "[My Style]". The square brackets indicate that the text being shown does not have a translation available. If you choose a value supported by any of the out-of-box templates (such as "Color 1"), then a translation will happen to be available, so the square brackets won't appear. A style setting established using a <meta> tag, as described here, is only shown on the Styles tab when that setting is also referenced in at least one actual style or HTML tag, as described in the next sections. <tag-name> is the name attribute for the xrm/designer/setting meta tag that establishes the relevant Styles tab setting. <value> is a value that will be replaced when a user edits the relevant Styles tab setting. You can only use these pairs of CSS comments in styles and classes defined within <style> tags in the <head> section. There must furthermore be only one set of <style> tags present, with all CSS styles set up there. Here is an example where you can see an xrm/designer/setting meta tag that creates a color-picker control called "Color 1" on the Styles tab. A CSS style then applies this setting to establish the text color for <h1> elements. property-reference= "<attr>:@< tag-name >;<attr>:@< tag-name >; …"
<attr> is the name of the attribute to be created. <tag-name> is the value of the name attribute for the meta tag that established the setting. Multiple attributes, if needed, must be separated with a semicolon within a single property-reference attribute. Here is an example where you can see xrm/designer/setting meta tags that create two settings for controlling a hero image (banner) in the document, with controls called "Hero image" and "Hero image height" on the Styles tab. The property-reference property is then used in an <img> tag to implement those settings.